The sago palm (like quite a few of the common names recently featured on my blog, this one is also misleading; it is not a true palm) is native to Japan, where it has existed since the time of the dinosaurs. In fact, ferns, lycophytes and cycads were some of the dominant vegetation during the Jurassic period. 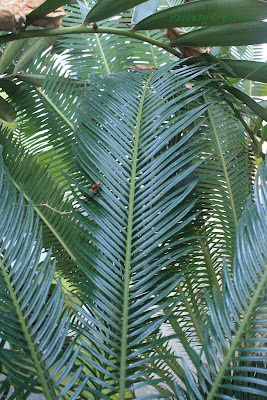 The cycads, unlike the lycophytes and the ferns, remain almost unchanged today from their ancestors (ferns and lycophytes are much smaller than they used to be!). 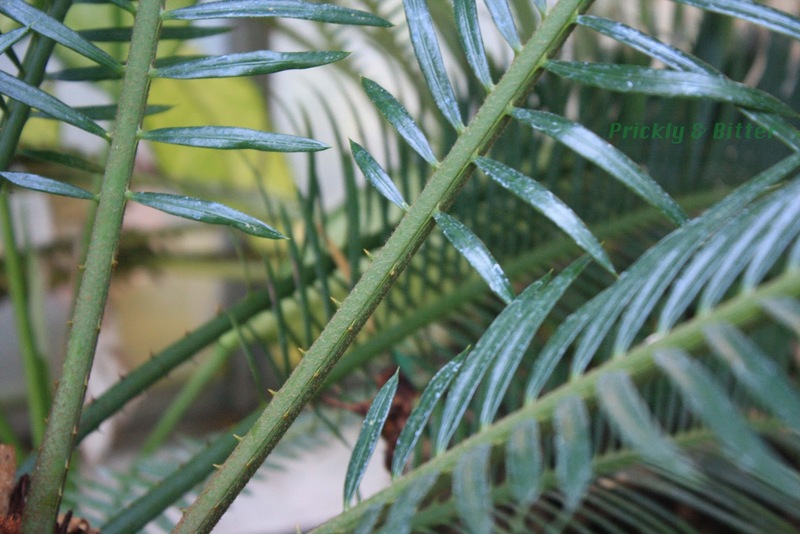 There are an estimated 305 species of cycad still alive today (an estimated 1,000-2,500 species once existed), and unfortunately almost all of them are on the IUCN Red List of near-threatened, threatened, endangered, or critically endangered species. All cycads are very long-lived (some estimated based on their height to be over 1,000 years old), but grow very, very slowly. 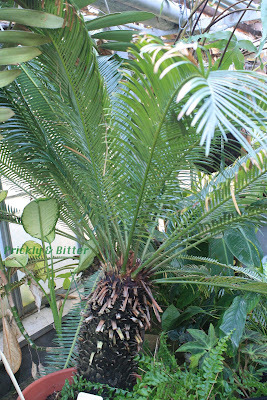 The tallest cycads in the world are in the southern half of the African continent, and can be up to 6 meters tall (most cycads rarely reach a height of 2 meters before succumbing). As we all know, poaching is a huge problem in many countries in Africa, with rhinos being hunted to near-extinction for their horns, and elephants being hunted for their tusks. While both of these activities have been illegal (according to local and international laws) for quite a while, they still occur often enough to have anti-poaching officers in all national parks in Africa that carry machine guns; their orders are shoot first, ask questions second. What I found absolutely mind-boggling is that many poachers in South Africa aren't after big game animals; they're after cycads. With the recent boom of very, very rich people in different countries in Africa, each of them wants to make a special statement in their choice of landscaping around their homes. Large, mature cycads are hunted in the wild, all of their foliage stripped off so that it's nearly impossible to determine species, let alone what group of plants it belongs to, then shipped off to their new destination. Once dug into the ground, they will readily root and (albeit slowly) regrow their leaves. Depending on the species, cycads can be sold on the black market for up to USD$30,000 each! There are now anti-poaching officers who are responsible for ensuring cycads are not being actively hunted in the wild; they parole the national parks in South Africa, Zambia, Mozambique, Kenya and Namibia just like big game officers. I'm proud of the stance they're taking to protect their native and endangered species! Despite this species being near-threatened in the wild, it occurs in huge numbers in cultivation, grown for ornamental purposes and also for the starch in the centre of the stem (which, when extracted, is called sago). Once the starch is washed (the stem tissues of the sago palm contain various toxins, so the starch must be washed before it can be consumed), it is processed into its various forms and shipped out to those who use it. When rolled into small balls, it is used interchangeably with tapioca; when you drink bubble tea you just might have sago bubbles instead of real tapioca bubbles! The small sago beads are also used to make sago pudding, which I hear is quite good (I've never had an opportunity to try it; it's on my "to do" list!). If you have a sago cycad (I like this name much better than sago palm; it better reflects the actual plant!) in your back yard and think it would be a fun thing to use as a food source, I strongly urge you to reconsider. Leave the starch extraction to the experts. 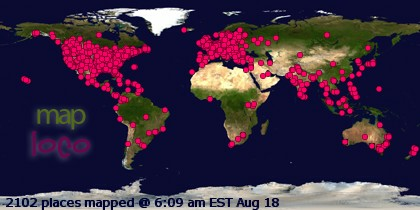 Consumption of improperly prepared starch from the stems of cycads (and consumption of their seeds, which you should NEVER do) has led to outbreaks of a Parkinson-like disease in Guam (and possibly other Southeast Asian countries), which will eventually lead to death. 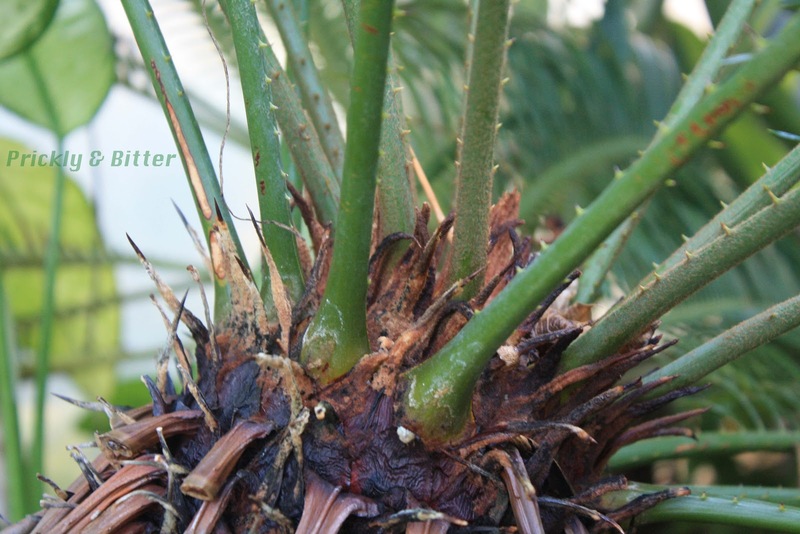 Cycads are dinosaurs of the plant world, we should make sure we treat them with the respect they deserve!